Show appearances continue to be added for the remaining months of 2016 for IPMS Middleton Cheney. The latest to be confirmed is the Sutton Coldfield Model Spectacular, which will mark the most northerly show the club has attended to date. The show is scheduled for the 11th September, meaning the club will have two consecutive weekends of show activity once again! Club secretary Sam, and fellow member Matt will be taking the ever-popular Star Trek 50th anniversary display to Sutton Coldfield. We’re looking forward to making our debut and yet another show this year. We’ve had a fantastic calendar of show visits in 2016, and we’re grateful for the invitation to display from the Sutton Coldfield Model Makers Society. Thanks lads! 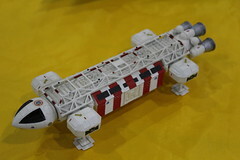 Courtesy of the fantastic efforts of John Marriott, you can view all of the brilliant science fiction and fantasy models that were on display at this year’s ModelKraft show in Milton Keynes in the video below. In addition, he has kindly made a special feature of our own 50 Years of Star Trek display in the video, which you can watch from 6:33 onwards. Our third model show in six weeks! Following on from the Poole Vikings show and ModelKraft, IPMS Middleton Cheney made its debut at IPMS Gloucester’s show on the 8th May. It was an absolutely beautiful day, a shame to be inside perhaps, but seeing lots of new stuff and being able to display our 50th anniversary of Star Trek feature made up for it! The show itself was a lovely, cosy affair and we were impressed with the sheer number of clubs and traders accommodated in the venue, so kudos to IPMS Gloucester for getting us all in! We had lots of interest in our Star Trek display which was nice to see. As sci-fi subjects tend to be more niche, especially on the show scene, with our sci-fi expert members we have a fantastic opportunity to really bring something different and unique to a model show, and the interest we receive as a result is a great reward. Top tip to other clubs: the young ‘uns love a bit of popular culture! While at ModelKraft we had our whole stand dedicated to Star Trek, in Gloucester we had a few F1 cars creep into proceedings as well, courtesy of James! There was no doubt about the main theme though, and we’ll be carrying this through the other shows we attend right until the end of the year. Are you a budding model builder, or an experienced hand, and live in the Banbury area? Young or old, we’re always on the lookout for new members! Whatever your interest, why not pop along to our next meeting, which will be on the 19th May. All the details on how to get there can be viewed here. 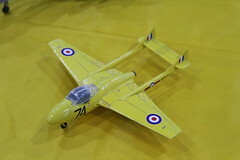 Just under two weeks ago IPMS Middleton Cheney attended the ModelKraft show in Milton Keynes. Always a well-attended event with plenty to look at, 2016 was no different! As one of the nearest shows to our club, we always like to make an appearance and this year was the perfect occasion to properly debut our special Star Trek display which made its debut in limited form at the Poole Vikings show two weeks previously. With ModelKraft traditionally featuring a strong sci-fi contingent it was the perfect venue to get the display out there in final form, and it’s not for the faint-hearted! Featuring a whole range of Starfleet ships and many alien vessels too, the aim is to cover as many areas within the Star Trek history. With the original series having been first aired in 1966, it’s a history that covers 50 years in 2016, hence it being our focus for our show displays this year. We had a great time at the show, and it’s always great to see the interest in what we do, so if you were there and stopped by our stand, then thanks! 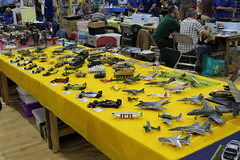 Also, thanks to Milton Keynes Scale Model Club for putting on another fantastic event. Next up for us is the IPMS Gloucester Show this Sunday, 8th May. If you’re attending we look forward to seeing you there!